Matt Harvey finally notched his first win of the year, going 5 innings with 7 hits, 2 runs (both earned), 1 walk (to Nick Markakis), and 5 strikeouts. That walk came in the fifth inning, when Harvey has traditionally labored; fortunately, a dead-on throw from Yoenis Cespedes to Travis d’Arnaud kept A.J. Pierzynski from bringing Markakis home to end the fifth and get Harvey through the minimum. Cespedes extended his streak of extra-base hits to 7; over those 7 games, he’s hitting .345/.406/.931 with a .400 batting average on balls in play. In the first 8 games of the season, he hit .233/.324/.333 with a .333 BAbip. The Mets were 3-5 during those first 8 games and 5-2 during Cespedes’ streak. Yo left the game after an extended rain delay due to aggravating his leg injury sliding into second for last night’s double; Juan Lagares may make the start in center tonight. Ces has never faced Braves pitcher Jhoulys Chacin, but Lagares is 2-6 lifetime against him with a double. Curtis Granderson hit two home runs including one grand slam, along with a single, for 9 total bases and 5 RBIs. One of those RBIs came when Harvey made it to first on a throwing error by the pitcher, trying to force Asdrubal Cabrera out at third. On this road trip, Granderson is hitting .353/.476/.941 on a close-to-league-average .300 BAbip. Granderson is 1-2 with a walk against Chacin. Neil Walker is .333/.333/.556 against Chacin in 9 plate appearances. Freddie Freeman extended his lifetime hitless streak against Matt Harvey to 9 plate appearances with a pop foul, a flyout, and a swinging K. Freeman hasn’t hit well this year (.167/.318/.241, compared to last year’s .276/.370/.471), but he’s been fairly good against current Mets: he has an OPS above 1 against 5 Mets pitchers, including starter Steven Matz(1-3, walk), relievers Addison Reed (1-2) and Jerry Blevins (3-7), and closer Jeurys Familia (5-11, walk, 2 home runs). 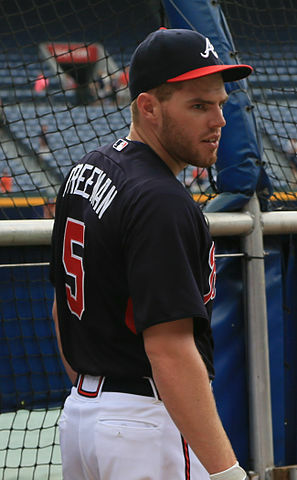 Freeman hit .246/.317/.509 in his first 15 games last year, so his OBP isn’t too big a surprise – it’s really the last of extra-base hits that’s causing the Braves trouble. Steven Matz is largely unproven against the Braves. His only previous start against Atlanta was in September of last year, allowing 6 hits and 2 walks for 1 run. Current Braves have hit him reasonably well, so it will be good to see whether Matz continues what he started last time out or whether he looks more like his first start against Miami.